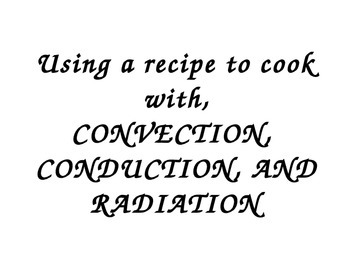 This is a 31 slide power point show designed to make conduction, convection and radiation apply to the real life situation of cooking. It does so with a great dose of humor as you can inject teachers' names. The slides are ridiculous, a bit gross, and animated...just the kind of things that kids remember. Project the slides as the kids shout out their favorite (or not) teachers of friend’s names. Type them into the show on blank lines. 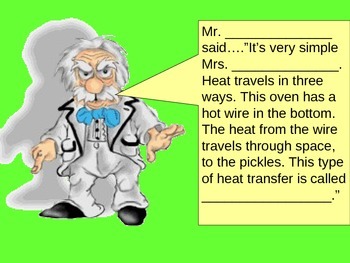 Then as you present the show, discuss each heat transfer concept as you and the class prepare the imaginary recipe. 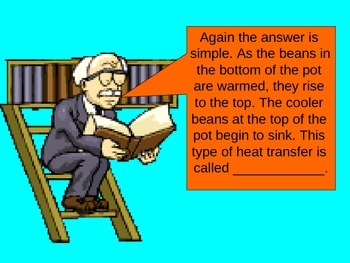 The slide show is accompanied with a matching worksheet. Answer key is included. LOTS OF FUN!